CHILDREN as young as eight are receiving treatment for underdeveloped muscle tone in their arms and hands because of their growing addiction to modern technology. So chronic is the situation that teachers are warning that a growing number of students will perform poorly at the upcoming NAPLAN tests because they lack handwriting skills. Educators have also taken a swipe at the tests themselves, saying the national curriculum is being forced on children too early and the pressure to achieve key National Assessment Program Literacy and Numeracy (NAPLAN) goals leaves teachers with no time to engage children in critical play-based learning. 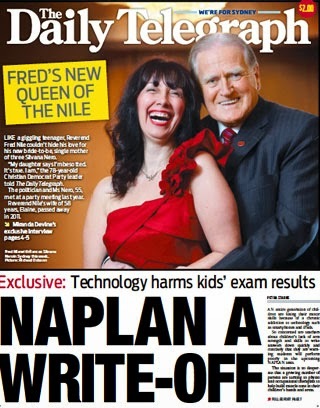 "NAPLAN a write-off", Daily Telegraph, Page 1, May 4, 2013. Click here to read this story online.